What does the Division of Emergency Management (DEM) do? DEM (pronounced D-E-M) plays an active role during emergencies and disasters. The Division coordinates emergency management efforts among State agencies, in collaboration with federal and local government. These efforts include preparedness, response, recovery and mitigation. DEM also brings subject matter experts and multiple state agencies together at the State Emergency Operations Center to support and coordinate response and recovery as needed. Though Utah is not located in the hurricane path or tornado alley, disasters strike here. For the list of threats and hazards in Utah see the State Hazard Mitigation Plan. When no incidents are underway, the Division’s year-round efforts prepare the State of Utah to better respond to and recover from disasters. DEM prepares individuals and communities for disasters through outreach and training programs and passing through federal grants. The division trains nearly 2,000 emergency responders annually in areas such as domestic preparedness, hazardous materials, public information, incident command, professional development and others. 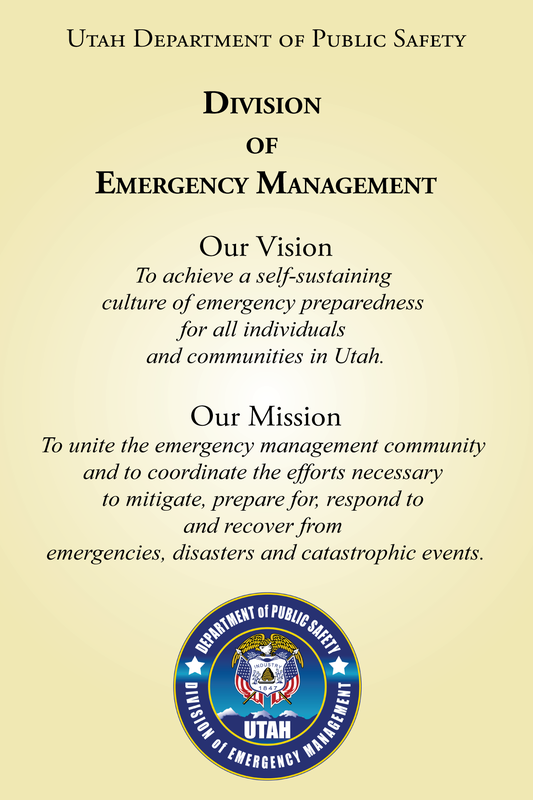 Thousands of Utahans receive emergency preparedness education material from DEM through our Be Ready Utah program. This information helps families prepare to be self-reliant during a disaster situation. Some programs, such as CSEPP, are no longer needed in our state for various reasons. You can read about our former programs here.